Give back to Mercy every time you shop! We work with retailers to seamlessly benefit Mercy each time you shop in-store or online at no additional cost to you! Check out the options below to find the best method for you to give back to Mercy. The Benefit Mobile App is our newest option and generates the highest percentage given back to Mercy! Earn 2-20% for Mercy by buying and redeeming egift cards instantly from your mobile device! 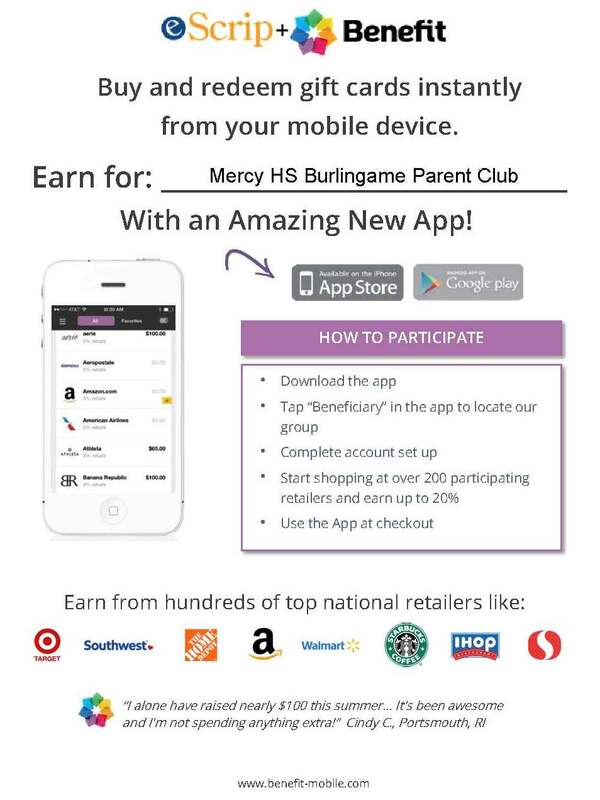 Download the Benefit Mobile App, enter "Mercy Parent Club" as the Beneficiary, and you're ready to shop! Follow the steps below to start giving when you shop with over 160 retailers through the Benefit App. 1. Once you have downloaded the Benefit App, select "Retailers" to purchase an egift card for yourself to use in store or online, or select "Send a Gift" to purchase an egift card to electronically send to a friend. 2. Select from over 160 retailers! 3. Indicate the amount you wish to purchase. For "Send a Gift" you may choose standard incremental gift amounts, however with the "Retailer" option you may enter the exact amount to the cent of your purchase. 4. Shop instantly in-store or online with the provided barcode and track the dollar amount given back to Mercy. Note: Amazon does not show a pop-up message that indicates that you are shopping for Mercy, but if you click the SHOP FOR MERCY link each time, know that your donation is allocated to Mercy High School! Bookmark this webpage for easy access to Shop for Mercy Amazon shopping! Earn up to 3% for Mercy through eScrip, a program that partners with local grocery stores. To use, text to register or log on to www.escrip.com. Web browser users to go to “sign up” tab on www.escrip.com. Text users see instructional image below. Designate Mercy High School- Mercy Parent Network - eScrip Group ID – 137617387. Register your debit/credit cards and shop!